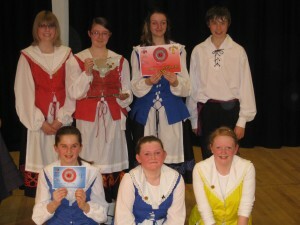 Congratulations to 7 of our Junior Memebers who took part in Chruinnaght Aeg Concert/Competition on Wed 19th May 2010. They performed a balance programme which had a selection of traditional and newly created dances. 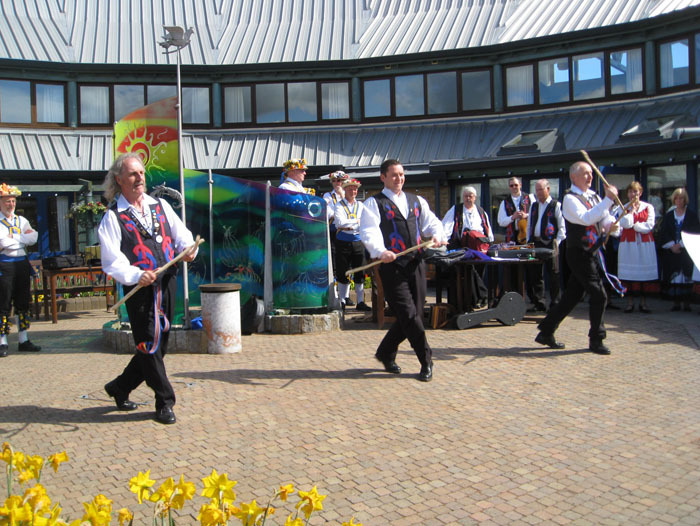 Our only male dancer that night performed a polished performance of Gorse Sticks (Well Done Tim! ), and the girls performances of Harriers in the Heather, the Ladies Jig and Gyn Ennym were also very well performed (Well done Girls). Four of the girls competed in the group dance category in which they danced Kerrin Rinkee. They were foot perfect and extremely enjoyable to watch, couldn’t have asked for anymore. They won this category with 89 marks. We got the highest overall mark of the evening and walked away with the Chruinnaght Aeg Glass Trophy. Thanks go to Rachel for all her hard work that went into putting the programme together and putting the time in to practice with them. Well done, very proud of you all!! Taking a break from their fund raising activities, to raise money to hold an International Dance Festival on the Isle of Man during August next year, on the evening of Friday 30th April, 13 members of the Manx Folk Dance Society travelled to Liverpool by sea or air, to be met by some of their hosts from the Ladies’ Mockbeggar Morris Side of Clog Dancers, before being taken for a meal at the Farmers Arms, Frankby. At 4.45am on Saturday 1st May, the now 18 members of the Manx Folk Dance Society (Norma & Dave joined them with their camper van, and the Evans family arrived in the early hours from the late night sailing to Heysham) gathered at Thor’s Stone, Thurstaston Hill, with the Mersey Morris Men and the Mockbeggar dancers to dance and see-in the May Day dawn. Luckily the weather was kind (although a little chilly) and there was a wonderful sunrise! At 6.30am a welcome breakfast was provided at GJ’s Coffee Shop at Thurstaston Visitors Centre. After a quick visit back to their hosts’ houses, the 3 groups went to dance at 10.30am for some of the children at Claire House Children’s Hospice, Clatterbridge Hospital. 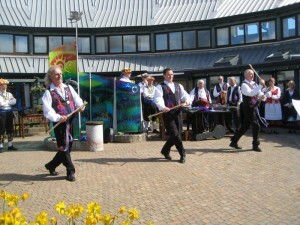 They danced outside and a couple of the visiting siblings were enticed in to join the Morris Men. Dancers for the May Weekend and they reciprocated with a DVD and IOM Book featuring a photograph of the Manx Folk Dance Society. Luckily the only rain came when they were dancing INSIDE the Hall!! reminder of the day!! It was decided to continue the dancing inside – to a much bigger – and warmer!- audience. The displays finished with the Manx dancers performing the ‘train dance’ when all their dancers, as well as the dancers from the other 2 groups joining them on the “train” for the final bow!! Then it was home for a meal before meeting later at the White Lion Pub in West Kirby for a final full get-together. Inn, Willaston. Most of the Manx Folk Dance Society then left by sea or air for home – tired but happy after a very enjoyable weekend with long established dancing friends. Log in - Copyright © 2019 Manx Folk Dance Society.